It’s as simple as that: if it derived from such laws, it should always work. But it doesn’t work, therefore it is not a logical consequence of such laws. The dogma “eat less and move more” is wrong and absurd. And from the moment some people “thought” that this dogma was the direct incarnation of those laws, any alternative proposal is said to be contrary to the laws of thermodynamics, and therefore wrong. Another way to demonstrate that the theory of energy balance is not a corollary of the laws of thermodynamics is finding other theories, different from the “energy balance” theory, that also satisfy the laws of thermodynamics. A few days ago I published an article (“Thermodynamics for dummies “) exemplifying exactly that: how alternative explanations of how you lose or gain weight are perfectly compatible with the first law of thermodynamics. But please note that the fact that a theory satisfies those laws doesn’t mean it’s right, neither that it is useful. “Eat less and move more” is an example of that: it is compatible with the laws of thermodynamics, but it has been proven false. I think it is also counterproductive for human health (see). The laws of thermodynamics can’t be used to predict the behavior of a complex living organism, it just tells properties of such behavior. It is the physiology of the living organism what determines its evolution. For example, Gary Taubes in one of his videos shows two photographs of the same child at different ages and with different body weight. The first law of thermodynamics can tell us that if you’ve gained weight, then you ate more than you spent. But it can’t explain why the child grew up. Knowledge of how our body works (e.g. the hormones) can help with that, but thermodynamics’s laws can’t. Thermodynamics only tell us that no matter waht happens, and regardless of why it happens, the behavior will fulfill certain conditions. It can’t predict the outcome, nor show us a way to change the process. There is a very interesting 2007 study named “A high-fat, ketogenic diet you induce unique metabolic state in mice “. I don’t use to give much importance to animal studies, but in this case there is no reason to ignore them: the laws of thermodynamics are always met, also in animals. If the laws of thermodynamics had something to say in nutrition, they should predict the weight evolution of any animal. At the end of the day what the “experts” tell us is that physiology doesn’t count and that gaining or losing weight is a simple matter of eating more or less. Mouse or person, if you eat more you will gain more weight. Mouse or person, if you eat the same amount of food you will gain the same amount of fat. The fourth diet (CR) is restricted in calories and provides only 66% of the normal caloric intake of those small animals. The “Calories In Calories Out” paradigm tells us that those mice that eat a 66% of the intake of the rest (CR group) must end up with less weight than mice from other groups, while the three other groups (HF, KD and C) must end up roughly equal in weight. 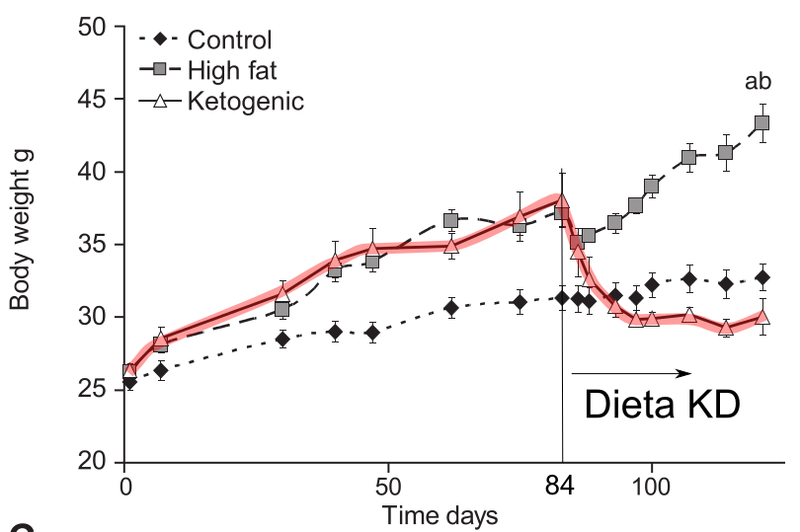 The reality is that the “Calories In Calories Out” paradigm is wrong: after two months there was no difference in the weight of the ketogenic group (KD, black triangles in the graph) and the calorie-restricted group (CR, circles and discontinuous line). And remember that the CR group had consumed 66% of the calories consumed by the KD group. Very different caloric intake, the same weight result. And indeed, there were no differences in body composition (body fat mass, and lean mass) between the CR and KD groups. It is also interesting to know that the KD mice showed much lower levels of postprandial insulin, compared to the other groups of mice. A final curiosity: in one study, female mice of the CR group stopped having the menstrual cycle, something that did not happen in the KD group. A second experiment, from same study. Now for 84 days all mice get fatter and fatter with the HF diet (high in carbohydrates and fat). At that moment, a part of them is moved to the KD (ketogenic) diet. The output? 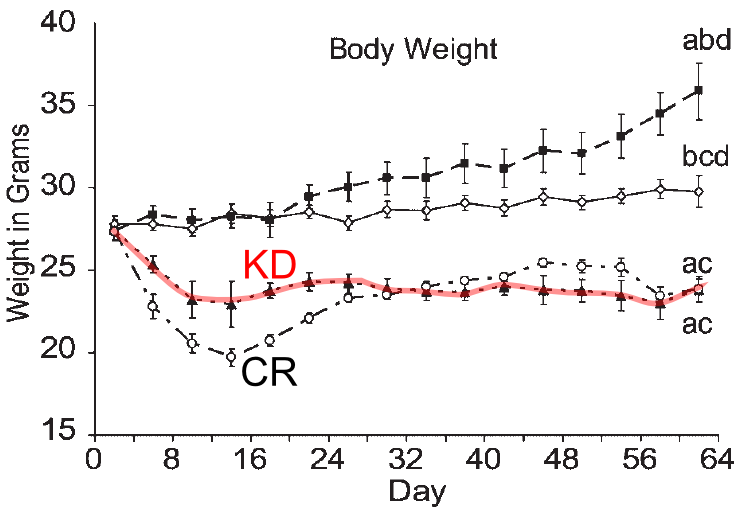 The KD group’s mice lost weight and ended up with even less body weight than mice in the control group. Those who followed the HF diet never stopped gaining weight. The “Calories In Calories Out” paradigm tells us that to lose weight you have to eat less and move more. Is that what happened in the experiment? Did mice ate less became of the ketogenic diet? No, they continued eating roughly the same amount than before (after the change of diet a little less, then a little more and once the weight stabilized, the same). So how is it possible? Again, mice from the KD group generated 15% more heat than the HF group, and their oxygen consumption (another indicator of the energy expenditure of the mice) was 34% higher than in the HF group. Mice in KD group ended up with virtually the same amount of body fat than those from the control group. The HF group ended up with more than twice as much fat as both groups. KD mice didn’t lose muscle mass. The KD group passed a glucose test with better results than the HF group. In the HF group “exploratory activity” was reduced, but not in the KD group. It could be said that getting fat made them more sedentary. Eating the same amount resulted in very differently output in terms of weight (and health). The laws of thermodynamics are always fullfilled, what doesn’t are the “theories of energy balance”, i.e. the “eat less and move more”, counting calories, “eat everything but in moderation” and “you are fat because you’re a sloth and a glutton”. By specific dietary manipulation, weight loss may occur as a result of various metabolic changes without restricting calories. Losing weight without eating less and without reducing your metabolism … All this reminds me of the Sam Feltham‘s experiment (who, by the way, recently published a book ).